This New 2018 Mazda3 4-Door Touring, Stock number M4471 features a stunning Snowflake White Pearl Mica exterior complimented by a desirable Black W/leatherette Seat Trim Synthetic Leather interior. 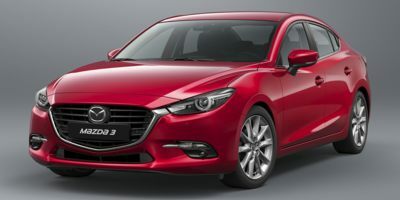 Factory equipped with an impressive 2.5l 4 cyls engine, an automatic 6-speed transmission and front wheel drive, this Mazda3 4-Door produces an impressive 27.0 city MPG / 36.0 HWY MPG. A few of this Mazda3 4-Door's key features include: Push Button Start, Automatic Climate Control, Heated Seats, Keyless Start, Aluminum Wheels, Keyless Entry, a Rain Sensing Windshield Wipers, Cross Traffic Alerts, Synthetic Leather, Electronic Stability Control, Multi-zone Climate Control, Heated Mirrors, Steering Wheel Audio Controls, Power Windows, Side Mirror Turn Signals, Blind Spot Monitoring, an Onboard Hands-Free Communications System, an Auxiliary Audio Input, Steering Wheel Controls, Daytime Running Lights, Power Locks, a Power Drivers Seat, Integrated Turn Signal Mirrors, a Electronic Messaging Assistance, Front Wheel Drive, Traction Control, Brake Assist, Power Mirrors, a Leather Wrapped Steering Wheel, Bucket Seats, an Auto Transmission with Manual Mode, a Drivers Air Bag, a Tire Pressure Monitoring System, Anti-Lock Brakes, a Rear Head Air Bag, Disc Brakes, a Driver Illuminated Vanity Mirror, Air Conditioning, a Pass-Through Rear Seat, Cruise Control, a High-Definition Radio, an Adjustable Steering Wheel, an AM/FM Stereo, Bluetooth Connection, an MP3 Compatible Radio, a Gasoline Engine, a Front Side Air Bags, Child Proof Locks, an Auto Headlamp, a Front Head Air Bag, a Passenger Air Bag Sensor, Intermittent Wipers, a Passenger Illuminated Visor Mirror, Remote Trunk Release, a Spoiler / Ground Effects, a Trip Computer, Vanity Mirrors, a Tilt Steering Wheel, a Spare Tire (Small Size), a Rear Window Defroster, Power Steering, a Bench Seat, Variable Speed Intermittent Wipers, and a Passenger Air Bag. Contact us today to schedule a test drive of this 2018 Mazda3 4-Door Touring! Or stop in at 3200 North Calumet Ave Valparaiso, IN to check it out in person!